The international foreign exchange market operates around the clock It opens on a Monday morning in Hong Kong, while it is still Sunday night in San Francisco. Throughout the day, markets begin trading in Tokyo, Zurich, Frankfurt, Paris, London, New York, Chicago, and finally the West Coast of the United States. When the markets close in Los Angeles and San Francisco on Monday evening, Hong Kong is one hour away from beginning foreign exchange trading on Tuesday. In The Global Economics Game you have the power and influence of a central bank to deliberately intervene in the foreign exchange market to either appreciate or depreciate your nation's currency. The foreign exchange market is the monetary nexus between countries that makes it possible for international trade to be accomplished more efficiently than barter. Because each nation uses its own monetary unit, people in one country who want to purchase something in another country must exchange their own currency for the other to accommodate the transaction. Many travelers research foreign exchange rates before purchasing airline tickets or other means of travel to other countries. The foreign exchange market is where one nation's currency is traded for another. Exchange rates can also affect your credit cards while visiting different countries. Somc credit cards may have a different exchange rate. Some cards may also charge foreign transaction fees while outside your home country. The top credit cards won't charge these fees and will have consistent exchange rates. You will fine infor online about what top credit card is best for you and your travels. On any given day approximately $1.5 trillion in foreign exchange is traded! By any standard, that's a lot. The figure dwarfs the value of daily global stock trading. It is almost 20% of the United States GDP and nearly the size of the U.S. federal budget for an entire fiscal year. Contrary to what many people think, most foreign exchange trading is not in currencies, per se. Rather, it is in the form of bank deposit balances. Also, a surprisingly small number of banks account for the bulk of the volume, and nearly 90% of all trades involve U.S. dollars. Although a few countries officially fix the exchange value of their currency to a key currency or basket of currencies, the exchange rate between most currencies is primarily determined by the market forces of supply and demand. When people in Europe supply euros to demand dollars in order to purchase U.S. products, the exchange value of the euro depreciates and the dollar appreciates, all other things held constant. If the supply of a currency exceeds the demand for it, its value will fall in the foreign exchange market. On the other hand, if the demand for a currency exceeds its supply, then its value will rise. An increase in the supply of one currency is simultaneously an increase in demand for the other. The picture below shows how this works in the context of international trade. (A) French citizens supply euros to their banks and demand dollars to import goods and services from the United States. The value of the euro falls from $1.00 to $0.98. (B) Simultaneously, the value of the dollar appreciates from 1.00 to 1.02 euros. 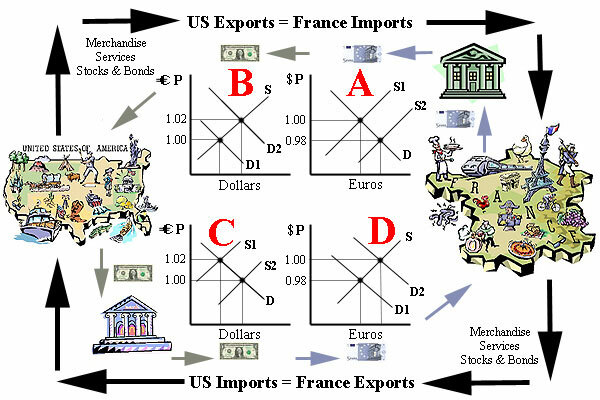 (C) U.S. citizens supply dollars to their banks to demand euros to import goods and services from France. The value of the dollar falls from 1.02 euros to 1.00 euro. (D) Simultaneously, the euro returns to equal $1.00. If supply and demand for the two currencies balance, then the exchange rate between the two currencies will remain stable. Exchange rates fluctuate when the relative supply and demand schedules do not balance. To really understand how the market determines whether the euro is worth $0.98, $1.00, or $1.02, one needs to look at the participants and the underlying market forces driving their decisions. The principal players or participants in the foreign exchange market are companies and persons who engage in international commerce and their banks, foreign investors, currency speculators, and central banks. Somewhat surprisingly, less than 20% of all foreign exchange transactions are directly linked to the needs of importers and exporters of internationally traded merchandise and services. Over 80% of the transactions involve short-term speculation and the purchase of foreign financial investments. Occasionally, central banks intervene in the foreign exchange market to deliberately manipulate the exchange value of their nation's currency. [You may wish to visit Alpari to view fundamental information about Forex and trading within the FX market and learn the definitions and intricacies of base and quote currencies]. 1. A country with a large population will demand more currency from a country with a small population than vice versa. 2. People will demand more currency from another nation when they find its products to be more appealing. 3. Countries with high and rising incomes will demand more foreign currency than countries with low incomes or those that are in recession. 4. Relatively high domestic inflation in a country will curtail the demand for its currency. 5. If importers expect prices in the exporting country to rise in the future, they will demand more of that currency in the present to beat the price increases. 6. People will demand more of a foreign currency if they can get a higher rate of return on financial investments in that country. 7. On the other hand, if foreign investors expect that inflation will undermine the real return on their investments in a country, then they will get rid of that currency and move their money to another country. 8. If people expect a currency to appreciate in the future, they will demand more of that currency in the present. 9. Central banks will demand more of a foreign currency if they wish to depreciate their own. While these generalizations can be applied to analyze short run fluctuations in exchange rates, there are two prominent theories that economists use to explain and predict exchange rate trends over the long run. One is the purchasing power parity theory and the other is referred to as the monetary approach. The purchasing power power parity theory suggests that exchange rates tend to adjust so that a person will have the same purchasing power to buy goods and services in another country after the exchange that he/she had with his/her own money in the home market before the exchange. The theory is founded on the law of one price which states that a commodity like a loaf of bread will, in effect, be the same price any where in the world if markets operate efficiently. Thus, if bread costs $1.00 per loaf in the United States and 100 yen in Japan, then the exchange rate will move toward $1.00 = 100 yen (and 1 yen will equal $0.01). Applying this theory, one would predict that relatively high inflation in one country will cause its currency to depreciate in the long run. This theory seems to predict reasonably well if one confines the analysis to internationally traded commodities. It tends to be nearly useless if the market basket of goods and services used to measure the price level includes many that are not traded internationally. Housing, auto insurance, gasoline, haircuts, evening dining, video rentals, entertainment, and other local services are examples. The monetary approach to exchange rate determination in the long run looks at the relative change in the money supply of two (or more) nations. In a sense, this is even more fundamental than the purchasing power parity theory, because money supplies affect prices. The monetary approach is built on the quantity theory of money which states that prices will rise in a country that increases its money supply faster than the rate of change in real GDP. Thus, if a country's real GDP can only increase at a rate of 4 per cent and the money supply is increased by 6 per cent, then the price level will rise by 2 per cent and the country's currency will depreciate accordingly in the foreign exchange market (assuming other countries are only increasing their money supplies by 4 per cent and their price levels are remaining stable). Looked at another way, if a country is increasing its money supply at 4 per cent and real growth is 6 per cent, then the price level will fall and the country's currency will appreciate in foreign exchange markets (assuming other countries are increasing their money supplies and their economies are growing at 4 per cent). The main conclusion(s) of the monetary approach is that countries which maintain relatively restrictive monetary polices and/or experience relatively rapid increases in productivity will see their currency appreciate in foreign exchange markets over the long run. Not all countries allow the exchange rate of their currency to fluctuate. Some countries officially fix or peg their currency to another key currency or a basket of currencies. In fact, the International Monetary Fund (IMF) identifies 10 classifications of exchange rate arrangements around the world -- ranging from those that are pegged, to those that crawl, to those that are market driven. Argentina, China, Egypt, Hong Kong, Saudi Arabia, and Vietnam are examples of countries that peg the exchange rate of their currencies to the U.S. dollar. Israel, Poland, Turkey, and many countries in Latin America fall into the crawling peg category. 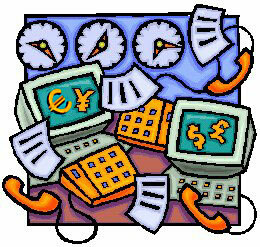 This means that the official exchange rate is automatically adjusted according to a predetermined formula. Australia, Brazil, Canada, India, Japan, Korea, Mexico, New Zealand, South Africa, Sweden, Switzerland, the United Kingdom, the Euro area countries (Germany, France, Italy, Spain, Netherlands, Belgium, Austria, Finland, Greece, Portugal, Ireland, and Luxembourg), and the United States are the major countries whose currency exchange rates are largely market driven. The main advantage of a fixed exchange rate system is that it (ostensibly) removes the risk of adverse exchange rate movements when planning to purchase foreign goods, services, and investments. When it works reliably, it encourages more participants in international trade. However, it has a mixed track record. The Bretton Woods System put into place after World War II was a fixed exchange rate system, and it worked reasonably well for about 2 decades. However, it collapsed in 1971. Currencies around the world had been pegged to the U.S. dollar and the dollar was convertible into gold at $35 per ounce. When it became clear that the dollar had evolved to an over-valued currency at the fixed rates, central banks began to dump their dollars in exchange for U.S. gold. When President Nixon closed the gold window, an international currency crisis ensued, and the dollar plummeted in a floating exchange rate market. The problem with pegged exchange rate systems is that the rates don't stay fixed. The foreign exchange market itself is more powerful and seems to find ways to unhinge them. The system requires a country to maintain large reserves of foreign currencies to supply the market when there is an excess demand for them at the official exchange rate. Capital flight occurs when investors fear that inflation or an inevitable currency devaluation will undermine the real rate of return on their investments. When the reserves are depleted, there is a currency crisis, and the country is forced to let its currency devalue and find the market equilibrium. The most recent examples of this occurred in Asia in 1997, Russia in 1998, and Brazil in 1999. On the other hand, the problem with a flexible exchange rate system is the high risk associated with market fluctuations. Suppose, for example, someone in the U.S. were to take their dollars, buy British pounds, and deposit the pounds in a British bank to earn an 8 per cent return. If the value of the British pound were to depreciate by 12 per cent, then the investor would lose 4 per cent when converting the pounds back into dollars. This possibility discourages many people from making foreign investments. And there is economic turmoil when those who were not dissuaded from international investment lose as a consequence of adverse currency movements. The shortcomings of the fixed exchange rate system and the free floating system have led the world's governments to attempts at international policy coordination and a system referred to as a managed float (sometimes called a dirty float). Under current arrangements, most countries let their currency exchange rates fluctuate according to market forces as described above. However, if a currency appears to be "overvalued" or "undervalued" by the market, or if the exchange rate movements are significantly adversely affecting an economy's macroeconomic performance, or if the policy-makers wish to use exchange rate manipulation to achieve a macroeconomic objective, then central banks will intervene in the foreign exchange market to deliberately depreciate (or appreciate) their currency. For example, the Plaza Agreement in 1985 involved central bank intervention to deliberately depreciate the U.S. dollar, because its high exchange value was retarding U.S. exports. Later, in 1987 the Louvre Accord sought to stabilize the dollar to prevent it from falling further. Although no major coordinated intervention has occurred recently, individual central banks have intervened to affect the exchange value of their currency. The most recent example occurred in late 1999, when the Bank of Japan dumped yen into the foreign exchange market to prevent its value from rising further. When the Bank of Japan supplied yen to the foreign exchange market, it demanded dollars and the value of the dollar rose as the value of the yen fell. The central bank did this, because the high and rising value of the yen had begun to retard Japanese exports and the economy was already in recession. Depreciating the yen would stimulate Japan's exports and the Japanese economy. In The Global Economics Game you have the power and influence of a central bank to deliberately intervene in the foreign exchange market to either appreciate or depreciate your nation's currency. If you depreciate your currency, your exports will increase and your imports will decrease. Your economy will grow faster, but prices will rise. If you appreciate your currency, your exports will fall and your imports will rise. The price level will fall, but the economy will contract. Place an Order: The price of 1 CD is $20.00 plus $5.00 for processing, packaging, and mailing. Volume discounts and annual site licenses for large institutions are available. THE GAME IS ALSO AVAILABLE IN DOWNLOAD VERSION WITH NO S&H FEE. You can place a direct order through PAYPAL or a credit card or make a printed copy of our order form and mail it to the address at the bottom of the form. Click here to place an order: order form..
IMF Staff. Exchange Rate Regimes in an Increasingly Integrated World Economy (June 2000).